During these difficult times for our country, when the Trump Administration has suspended the refugee resettlement program and attempted to paint all refugees as terrorists and security threats, Benach Collopy has continued the fight for human rights, including the right to seek asylum and protection from persecution. We are pleased to introduce our Clients of the Month for February 2017, Karla Duran and her six-year-old son Anthony. Karla and Anthony fled their home after their lives were threatened by the 18th Street gang in El Salvador. The 18th Street gang is not the type of street gang we are familiar with here in the United States. Rather, it is a sophisticated organization that operates with hierarchical structures, uses military grade weapons, and infiltrates law enforcement, security forces, and all branches of the Salvadoran government. It is the de facto government in Karla and Anthony’s community – they control territory and public spaces, tax the population for “safety,” limit people’s movement, and recruit members and supporters. Most importantly, the 18th Street gang establishes rules that they expect the population to follow and that, if broken, lead to serious consequences. In fact, any act of defiance or resistance to the 18th Street gang is viewed by the gang as a challenge to their power and authority, an expression of political opposition that must be eradicated through horrific violence in order to punish the opponent and to send a message to the rest of the community about what happens when the gang’s rules are broken. Unfortunately, Karla and her family became the gang’s targeted enemy when her husband refused the gang’s demands and expressed his opposition to their violent way of life. The 18th Street gang responded to his repeated defiance and opposition with escalating threats, first against his life, and then against the lives of his wife Karla and their six-year-old son Anthony. The family tried to relocate within El Salvador and hide, but the 18th Street gang soon found them and continued their relentless demands and threats. Karla and her family tried to seek help from the police, but the police told the family that they could not protect them. In fact, seeking the help of the police only increased the danger for Karla and her family. The 18th Street gang soon found out that the family had reported them to the police and were enraged. They labeled Karla and her family as the enemy and vowed to kill them the next time they found them. The family immediately fled to the United States in fear for their lives. Upon their entry to the United States, the family was separated and sent to different detention centers, Karla and Anthony being sent to the family detention center (also known as a “baby jail”) in Dilley, Texas. 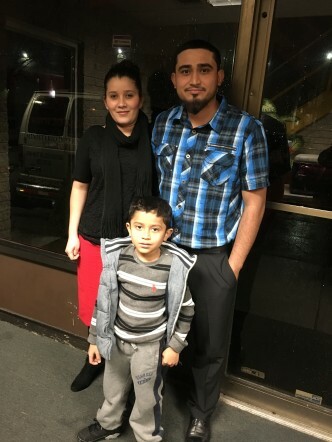 With the help of their attorneys, Dree Collopy and Adilene Nuñez, Karla and Anthony were released and were recently granted asylum protection by the Baltimore Immigration Court. Karla’s husband Hector is now seeking derivative asylee status based on his marriage to Karla. We are so happy that this lovely family can now live in safety and peace in the United States. Congratulations Karla, Anthony, and Hector!